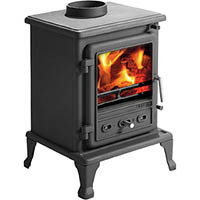 We have every type of Firefox 5 stove replacement part you could ever want including glass clips, door seal, door handle, fire bricks, baffle plate, bottom grate and basically anything else you can think of. Simply add the product you are looking for to your shopping basket, check out and your products will be delivered direct to your doorstep. There is a standard £10 postal charge which covers up to 15 kg in weight therefore many of our customers will buy more than one spare part. If you would like to discuss a package deal or our delivery charges in more detail, please contact us on telephone number (01706) 813393.